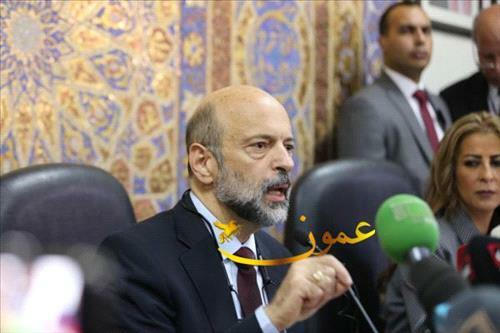 AMMONNEWS - Prime Minister Omar Al Razzaz said that Jordan will remain at the forefront of efforts to fight terror and dark ideologies that target innocents and attempt to undermine security and stability. During a visit to the General Directorate of Gendarmerie where he met with its director, Major General Hussein Mohammad Hawatmeh in the presence of Interior Minister Sameer Mubaidin, Director of the Public Security Department Major General Fadil Al Hmoud and Director of the Civil Defense Department Mustafa Bazaiah, Razzaz stressed the importance of supporting the armed forces and security agencies that offer sacrifices in defense of the homeland's security. The premier was briefed by the gendarmerie director on investigations related to the cowardly terrorist attack that targeted a joint patrol of the gendarmerie and the public security in Fuheis yesterday. "This cowardly act will not undermine Jordan's resolve, but will increase its strength, and its determination to uphold its long-standing values, and its national unity," he added. The premier stressed that the terrorists will be tracked down wherever they are, and that the perpetrators of the heinous crime will be brought to justice. He also praised the high competence of the security services personnel, their courage and professionalism. Al-Razaz offered his condolences over the death of gendarmerie Sgt. Ali Adnan Gogazeh, and wished the injured a speedy recovery .